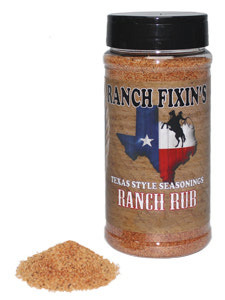 Ranch Rub is a blend of brown sugar, garlic, onion, chipolte peppers and special spices. Par boil either pork of beef ribs, generously spread RANCH RUB on the ribs then wrap them in tin foil. You can put em' on the grill or in the oven. Rub some on rib-eyes & T-bones or filets & you won't believe what it'll do to a pork chop! Rub a little RANCH into your next meal.